In today's fast-paced world there are countless choices to pick from to wet your whistle. A new trendy beverage that is gaining in popularity is sparkling waters and seltzers. Any drinks consumed between meals that contain sugar will put you at risk to develop cavities. Read nutrition labels and keep your eyes peeled for any added sugar. The main difference between seltzer water/sparkling water and tap water is carbonation. When a beverage is carbonated it becomes acidic. This acidity can cause enamel erosion. Once you lose enamel it doesn't come back. So, is sparkling water just as good as regular tap or bottled water? At the end of the day regular tap water or bottled water is the best thing for your teeth. But if you need a little something more to spice things up, seltzer water is significantly better for your teeth than soda or juice. Dr. Jensen says that like all things in life, take everything in moderation. If you're family is due for a cleaning or dental checkup, give Rogue River Family Dental a call at 616-866-7720! As a parent it’s bound to happen – your child runs up to you and says they have lost a tooth. If it’s a baby tooth, there is no need to worry. If it’s a permanent tooth, check out our blog post about what to do when you unexpectedly lose a tooth due to trauma or decay. Your child has 20 baby teeth, and these typically come out in the same order they came in. This means your kids will most likely lose their lower center teeth first. Children will lose their first teeth around the age of 6, but baby teeth can start coming out anywhere between the ages of 4 to 7. The earlier your child had their first teeth come in the earlier they will start coming out. Your kiddo will likely be excited about losing their first tooth – especially if you have discussed the tooth fairy with them already! Be sure to talk with your children about their baby teeth coming out – it shouldn’t hurt and they won’t feel hardly any pain. Encourage your children to wiggle loose teeth but not too much so teeth don’t come out prematurely. Have your little one gargle with some warm water if there's bleeding. You can also try having them bite on a clean towel, a piece of gauze or some paper towel. And not to worry, the majority of bleeding should stop within an hour. Let your child know not to brush too hard on the spot where a tooth recently came out. It will likely be tender for a little while and may start bleeding again with harsh brushing. Adult teeth will start to come in within a few weeks of a baby tooth coming out. You will notice they look a bit bigger, don’t look as white and have more pronounced ridges. Remember to teach your children good brushing and flossing habits throughout this process. After all, they will have these new adult teeth for the rest of their lives and it’s important to take good care of them. Call Rogue River Family Dental to schedule your next cleaning for your little one at 616-866-7720. You have all heard about the many foods that are bad for your teeth – soda, energy drinks, candy and sweets. But what about the many foods that are good for your teeth and overall oral health? Check out the list below that Dr. Jensen has compiled of foods that are good for you and your mouth! Yogurt is high in calcium and protein – it’s not just good for your overall digestive health, but good for your teeth too. The probiotics in yogurt benefit your gums by pushing out bacteria that can cause cavities. Dr. Jensen’s favorite yogurt is a plain Greek yogurt with some fruit or nuts added in. Like yogurt, both milk and cheeses are high in calcium and protein too. Eating cheese can raise the pH in your mouth and lower the risk for tooth decay. The amount of chewing needed to digest cheese increases saliva in your mouth which is good too. Dr. Jensen drinks a glass of milk every night with his dinner. Everyone has heard that an apple a day keeps the doctor away. There might just be some truth to that when it comes to your oral health! Fruits such as apples can be a good alternative to eating sweets and can cure cravings too. They are packed with fiber and water and also produce saliva in your mouth that rinses away bacteria and food particles. 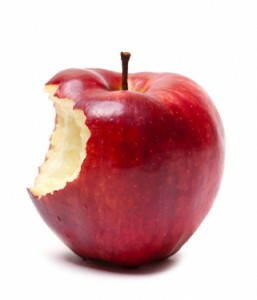 Eating an apple isn’t as effective as brushing your teeth, but it can tide you over until you have a chance to brush! Like an apple, celery and carrots can act somewhat like a toothbrush! The fibrous texture can scrape away food particles and bacteria. Both are a great source of vitamin A and C and antioxidants that are good for your gums too. Dr. Jensen packs bags of carrots and celery slices as snacks when he’s on the go. Almonds are an excellent source of protein and calcium and are low in sugar too. Try a small serving of almonds as a snack, or mix them in your favorite salad or stir fry. Dr. Jensen snacks on almonds quite regularly – they are a great snack when paired with a glass of wine! If you’re looking for something to drink that won’t harm your teeth, Dr. Jensen always recommends sticking to water or unsweetened tea. Both are the best options for your teeth with the exception of a glass of milk. Give us a call at 616-866-7720 to schedule your next cleaning! Happy Holidays from Rogue River Family Dental! The holiday season is upon us and I hope that you and your family are enjoying some time together. I hope you’re brushing and flossing regularly too! I wanted to reach out to each and every one of you to share thanks for your continued patronage and for allowing us to look after your oral health. This past year has been a whirlwind for me and for Rogue River Family Dental. I celebrated my first year with the practice in October, got married to my wife Heather in November, and added a new puppy, Blue, to our family too (you might see him around the office from time to time). I am thankful for all of your positive feedback and referrals to friends and family this past year. It means the world to me and my team. As most of you have already noticed, there have been some enhancements around the office including new paint and flooring in most rooms with hopes of making your visit as comfortable as possible. But what I am most excited about is the recent addition of digital x-ray and camera equipment! Our investment in this new technology will allow my team to provide you with better dental care in hopes of keeping a closer eye on any changes in your oral health. This new digital x-ray equipment makes images available immediately – meaning quicker dental appointments and faster access to results and next steps. Digital x-rays also use 70 percent less radiation than conventional, so it’s a much safer and more effective method for your entire family. If you’re looking for a last minute holiday gift for a friend or family member, we are selling Sonicare electric toothbrushes for $35 (It’s free if you successfully refer a new patient!). Stop by the office or grab one at your next appointment – this is the same toothbrush I use every day. And if you have an HSA insurance plan, this is a great time of year to use your remaining 2017 dental benefits. We can help you use those funds to purchase a toothbrush, schedule a cleaning or whitening treatment, and more. I look forward to seeing you and your family very soon for your upcoming cleanings. If you have any questions, feel free to call us anytime at 616-866-7720 or visit online at rogueriverdentistry.com. From my family to yours, I sincerely hope that you have a wonderful holiday season! Flossing removes plaque and food particles in places where a toothbrush cannot easily reach — under the gum line and between your teeth. 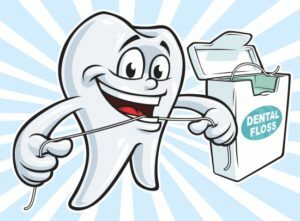 Because plaque build-up can lead to tooth decay and gum disease, Dr. Jensen recommends flossing every day! Gently curve the floss around the base of each tooth, making sure you go beneath the gum line. Never snap or force the floss, as this may cut or bruise your gums! Nylon floss is available waxed and un-waxed, and comes a variety of flavors. Because this type of floss is composed of many strands of nylon, it may sometimes tear or shred, especially between teeth with tight contact points. Single filament floss is a little more expensive, but slides easily between teeth, even those with tight spaces and is virtually shred-resistant. Both are great choices, and now-a-days there are many different products, flavors and flossing tools available in your local grocery or pharmacy. 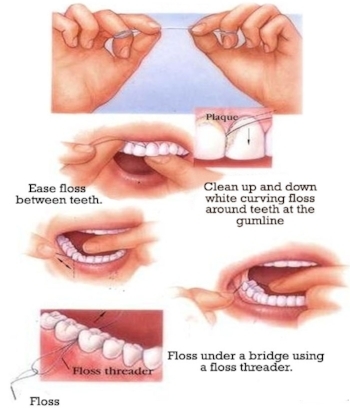 Keep floss handy, visible, and ready to use in order to make using it on a regular basis harder to pass up. Dr. Jensen likes to keep some in his car, in the office and at home. You never know when you’ll get something stuck between your teeth – and there’s nothing more annoying that not being able to get it out! We look forward to seeing you at your next appointment, and we’ll send you home with a new toothbrush AND some floss. Give us a call at 616-866-7720 to schedule your next cleaning! Dr. Jensen was back on FOX-17 this morning talking with health reporter Erica Francis about mouth guards and how to protect your kid's teeth during summer play. She visited the office and was even fit for her own mouth guard. Check out the story on FOX-17's website. Looking for a new dentist in Rockford Michigan? Give us a call and schedule your next appointment for your family -- 616-866-7720. Your child may have been riding his bike or playing baseball with friends and in he walks holding a tooth in his hand with a bloody lip. As a parent you’ll likely immediately think the worst and begin to panic. Or you are munching on a bucket of popcorn and bite down too hard on a popcorn kernel and immediately know you have broken or chipped your tooth…we’ve all been there. Not to worry – Dr. Jensen and his team have got you covered! For children and adults alike, the treatment for a broken or cracked tooth is similar. The most important thing to remember is not to panic. When a tooth breaks or chips, it may not hurt right away, but your tongue will quickly find the new sharp area in your mouth. If you’re missing a large portion of your tooth, or it has broken off entirely, you may feel some pain. Apply pressure with a tissue or gauze to stop any bleeding. If that doesn’t work, try a tea bag with pressure until bleeding stops. One consideration with a baby tooth that is bumped, broken or damaged is the possibility of damage to the underlying adult teeth. The most common treatment for a missing baby tooth is to let the adult tooth grow in – no implant or further treatment needed. However when the impact has been severe and your child has cuts or lacerations on the gums or lips, it may be a good idea to visit Dr. Jensen for an antibiotic or your pediatrician for a tetanus booster. The most common insult to permanent teeth is the result of sporting injuries or accidents. The best preventative measure is a mouth guard made by your dentist for use during sports. Treating a damaged adult tooth depends on the severity of the break and the age of the patient. Sometimes a simple filling will fix the problem when others may need a root canal or even an extraction. If an adult tooth has completely come out (avulsed tooth), the best thing to do is to pick up the tooth by the crown, gently rinse it and soak in milk on your way to the dentist. An avulsed tooth has the best chance of survival if it can be addressed and re-implanted within an hour, so call Dr. Jensen right away! Minor cracks: Surface cracks rarely need treatment, but sometimes a light polish of the area will smooth out any rough spots. Cracked tooth: Cracks can sometimes be repaired with a filling, but often require a crown to prevent further cracking in the future. If the nerve is damaged, you may need a root canal. Chipped tooth: Minor chips can often be polished and don’t always need treatment. Dr. Jensen will sometimes recommend a filling to keep the tooth from getting worse. Broken cusp: A break that affects the chewing surface of the tooth can be repaired but sometimes require an onlay or a crown. Serious broken tooth: When the nerve is exposed causing pain and bleeding – you will likely need a root canal to remove exposed nerve and get you back to chewing and eating normally. Decay-induced broken tooth: Your tooth has broken due to a cavity or old filling – in some cases the tooth may need to be removed, but can likely be treated with a crown or onlay. If you have any questions about any of the outlined conditions above, please don't hesitate to call Dr. Jensen and his team - 616-866-2270.